Sri Lanka's army says it has captured what it believes is the main operations centre of Tamil rebels in the north. Meanwhile the UN has criticised the Tigers for not allowing safe passage to its workers in areas they control. There has been no comment from the Tamil Tigers, who have suffered a series of reverses in recent months. The rebels are now confined to their sole remaining stronghold in the north - the area surrounding the town of Mullaitivu. There are fears for some 250,000 civilians trapped in the fighting. 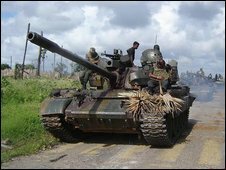 The pro-rebel TamilNet website has accused the army of shelling a hospital in Mullaitivu district. There is no way of confirming any of the claims as independent journalists are barred from conflict zone. Brig Nanayakkara said that the operations centre captured by the army consisted of an auditorium and a communications room. "We believe that this was their main operations room because it is located close to a three- storeyed bunker, which troops came across during clearing operations in the Dharmapuram area." He said that troops found a detailed map of Sri Lanka which showed rebel positions and army deployments up to brigade level. "We think it is a very significant place. This must have been a key centre they used." He said that the captured centre was partially underground. The army claims came as the UN issued what it said was "its strongest possible protest" to the Tamil Tigers. It accused them of refusing to allow UN staff to return from rebel-held areas where they travelled last Friday to deliver food and emergency supplies to displaced people. 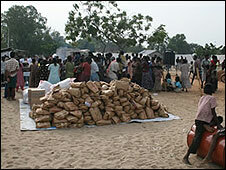 The convoy was the 11th to take supplies to people in the war-affected areas. Since October the UN says it has delivered about 7,000 tons of food and relief supplies. On Wednesday, Sri Lanka's military said it had set up a safe zone for civilians on the A-35 main road which links Paranthan and Mullaitivu. Human rights groups and aid agencies have raised concerns over the safety of people living in the conflict area. They want security guarantees from both sides so they can take aid and medical equipment to the north, and evacuate wounded and ill people. 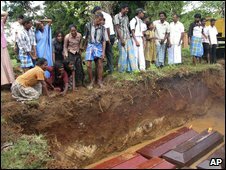 TamilNet said that the intensive care unit at Mullaitivu hospital had been destroyed by army artillery fire overnight. It said that the unit "was serving scores of wounded civilians" and had been "rendered completely out of function." "There are several dead bodies on the sides of the road and under the trees of the hospital," TamilNet said, "and all the medical staff and the patients who managed to move sought refuge in the bunkers and continue to remain there as shells continue to explode." The military has strongly denied being responsible. The campaign group, Human Rights Watch, recently accused the rebels of preventing people from fleeing the conflict area. Aid agencies say there are about 250,000 civilians in rebel-held areas. But the Tamil Tigers say that they are protecting civilians who voluntarily move with them. Correspondents say the rebels are also trying to move the war to the east.